The Washington Capitals completed the boldest move in their 27-year history yesterday, acquiring superstar right wing Jaromir Jagr from their playoff nemesis, the Pittsburgh Penguins, and fulfilling second-year owner Ted Leonsis's promise to open his wallet to secure prime offensive talent. "This puts us on the national scene, because we now have a really, really great hockey team," Leonsis said. "I hope this knocks the chip off people's shoulders in Washington and they come out and buy tickets. Now's the time to prove this is a hockey town, that it loves sports, and we're as good a team as any others." Jagr – considered one of the greatest hockey players in the world – had expressed his desire for a trade, and with two years and $20.7 million remaining on his contract, the cash-strapped Penguins obliged. The 29-year-old native of the Czech Republic was vacationing in Europe and was unavailable to comment last night. The Capitals did not part with a single player on their roster – or even one of their top minor league prospects – in acquiring the seven-time all-star. Instead, they gave up a trio of 1999 draft picks – forwards Kris Beech and Michal Sivek and defenseman Ross Lupaschuk – along with cash and future considerations for Jagr and defenseman Frantisek Kucera. "I'm shocked. It's unbelievable. Unbelievable. Wow!," Capitals defenseman Brendan Witt said of the deal. Despite a sturdy 6-foot-2, 234-pound frame, Jagr is one of the quickest players in the league, and his presence on the ice gives the Capitals the prolific goal scorer they have sought in an effort to be regarded as a Stanley Cup contender. Jagr, who will team with the potent Peter Bondra, has led the league in scoring the past four seasons and has won two Stanley Cups with the Penguins, in 1991 and 1992. His status in the league gives new luster and marketing opportunities for an organization trying to lure fans to MCI Center. Despite increasing their average attendance 7.3 percent last season to more than 15,000 a game, the Capitals lost about $20 million, according to majority owner Leonsis. Yesterday's deal will cost Leonsis an additional $25 million, according to sources, increasing a payroll that was already among the top 10 in the league. "I do think these things are smart business moves," Leonsis said. "We'll sell more tickets and we'll sell more [corporate] sponsorships. But we did this primarily because we want to win. I said by Year 5 [of his regime] we want to compete for a Cup; this is a great player and they don't come around that often." A run deeper into the playoffs – the Capitals were eliminated in the first round this year by the Penguins for the second straight season – is one way the team hopes to increase its profits. The Capitals will look to the addition of Jagr – and perhaps his subtraction from the Penguins – as one way to achieve that. Of seven playoff series between the teams, the Capitals have won only one. Jagr has scored five game-winning goals against the Capitals in 42 playoff games, including two series-ending goals. At the ESPN Zone restaurant in Washington yesterday, Capitals season ticket holder Steve Putnam said Jagr could be the player the team needs to advance in the playoffs. "I think it might even be bigger than if the Wizards get [Michael] Jordan," said Putnam, 33, of Arlington. "It's got to be the best trade they've ever done." Jagr's goal-scoring prowess, winning smile and signature long locks (since cut off) have endeared him to fans around the world. He was the first player to receive 1 million fan votes for the all-star game. Hockey sweaters bearing his name and number are worn by fans in Europe and North America, and when he arrived in Japan for the 1998 Winter Olympics (where he helped lead the Czech Republic to a gold medal) thousands of locals crowded the train station trying to grab his hair and take a photo. Jagr wears No. 68 in memory of the 1968 Soviet invasion of Czechoslovakia, which claimed the life of his grandfather. Jagr once told the coaches of the Czech national team that he wouldn't play for them unless he could wear that number and rebelled against the former Soviet bloc in less noticeable ways, carrying a photo of former president Ronald Reagan in his wallet. 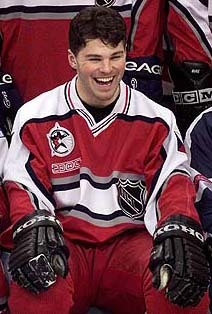 Jagr entered the NHL as an 18-year-old after being selected fifth overall in the 1990 draft and immediately became one of the league's most feared players under the tutelage of Mario Lemieux, a Hall of Fame center and now the primary owner of the Penguins. No longer able to afford his contract and facing the prospect of receiving no compensation when Jagr becomes a free agent in two seasons, Lemieux ultimately made the decision to trade his teammate. Jagr learned of the deal last night while in the Czech Republic. He spoke briefly with his agent, Mike Barnett, and Capitals General Manager George McPhee. "He wasn't surprised [to be traded], but he was mildly surprised it was to Washington because their name had not been publicly put forward to any degree," Barnett said. "But he was quick to respond that it's an excellent organization and a strong hockey club and it's a nice fit for where he's at in his career." McPhee said Jagr told him he was excited to join the Capitals. "I told him how fantastic our ownership is and how committed we are to winning and having fun," McPhee said. "And basically by the end of the conversation he wanted to say a few things. He said, 'I want you to thank your owner for me, and I have something to prove – I want to be the best player in the world.' I thought he already was." Staff writer Ross Siler contributed to this report.